ABERDEEN, S.D. 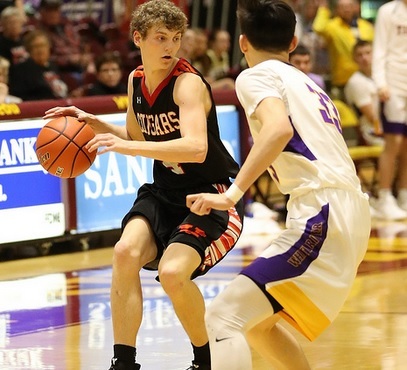 - At the South Dakota Boys State B Basketball Tournament, Viborg-Hurley stunned top seeded White River 69-61 to advance to the semifinals Friday. Viborg-Hurley was one of three eight seed teams to win on opening day. The heavily favored Tigers fell behind early, and could never get ahead of the Cougars who led 16-11 after the first quarter. Brodee Sherman was dominating for Viborg-Hurley, scoring 31 points. In other action, DeSmet defeated Jones County 60-55, Bridgewater-Emery edged Timber Lake 55-54 and Clark/Willow Lake rolled over Sully Buttes 58-26. Viborg-Hurley will play DeSmet and Bridgewater-Emery will play Clark/Willow Lake in Friday's two semifinal games. White River will meet Jones County and Timber Lake will play Sully Buttes in the consolation semfinals.